Everything EHS Software Should Be. We believe EHS software is more than just a tool to satisfy regulations. SafetySync simplifies worker safety management, while building a safety culture that lasts. We've got it all: online safety training, certificate tracking, policy distribution, competencies, equipment maintenance, and many more features. There's nothing to install with SafetySync. Access our software from any computer and be confident that your workers can too. You've got safety audits and legislation to satisfy. Take the worry out of both by ensuring your safety program is being effectively managed and kept up to date. Whether you call it EHS, HSE, SHE, OHS, or OHSMS software, we've got you covered. Our focus is safety minded companies across all industries. Bang for your buck. We hear it all the time. Don't worry about add-ons that cost extra. You get complete access to all our features for one low price. Accounting, sales, and operations all have their own dedicated software. Why not Safety? SafetySync is the evolution of spreadsheet and paper based safety programs. EHS Tools You've Been Looking For. Over 25 customizable tools that will not only help you score better on your next safety audit but ensure that your health & safety program is communicated to your workers. Track incidents and gather all your incident documents in one place. Run reports on incident types and ensure all your EHS documentation is organized. Run in depth reports on compliance across workers, locations, positions, and individual requirements. Over 50 pre-built safety awareness courses included with your subscription. You can also build your own with our SimpleLMS tool. Track any third party certifications for a worker from professional designations, to driver's abstracts, to H2S tickets, and more. Track vehicle inspections, safety meetings, incident forms, and more. Submit forms directly, via fax, via email, or use any online form tools. Add your equipment and keep inspections up to date as well as log any deficiencies found. ...if it's safety related, we've got it. Really, take a look. This isn't just a tool for your safety team to manage safety documentation for your workers. Your entire company is aboard the SafetySync train, from stakeholders, to the safety committee, to ops, to HR. 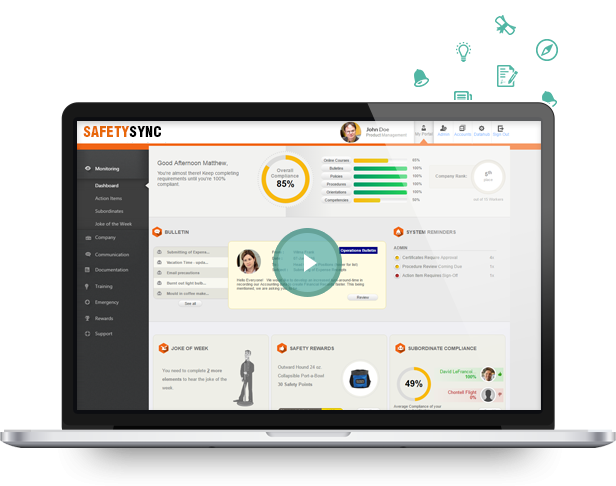 Each employee has their own SafetySync account to access your safety program online from wherever and whenever, while your safety team can easily track and trend safety compliance for your company. Your safety team can deploy your safety program to your workers and ensure that their compliance is kept up to date. HR has the peace of mind to know that new hires have proper training in place and can easily pull up their emergency contact information. Management can run compliance reports on command and regularly update their workers on safety issues via our communication tool. Operations can measure competencies in the field and know that their workers are able to perform their duties effectively. Workers get their own account that clearly lays out safety expectations from their safety team. Contractors can easily satisfy requirements setup for them by you, the Prime/General Contractor. See why our users love us on G2Crowd. * Looking for the catch? Sorry to disappoint you. There are no hidden fees, upfront costs, or even a contract. We believe in fair & transparent pricing.